Bus Buddies is a partnership between the Cy-Fair volunteer community and the school district to provide assistance to elementary students to help them in getting off the bus at the correct location. 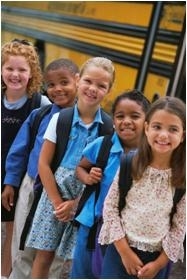 The program requires one "Bus Buddy" per elementary bus the first three days of school. The approximate time commitment is from 2:45 p.m.- 4:45 p.m. on August 26, August 27 and August 28.
the children off the bus at their correct stops. (1) Attend one of the training sessions, if not previously trained. our safety system where campus staff will assist you. (3) Enjoy helping the kids and driver! August 19, 2013 – 9:30 a.m. – 10:30 a.m.
August 20, 2013 – 6:30 p.m. – 7:30 p.m.
August 21, 2013 – 7:30 a.m. – 8:30 a.m.